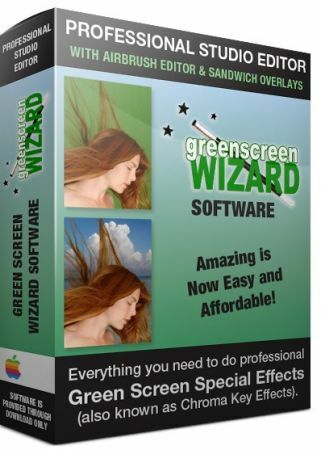 Green Screen Wizard Professional 10.4. Direct Download Green Screen Wizard Professional 10.4. A Photo Booth is an automated photography system that lets a user start a photo session that can take one or more images with live view image preview. The live view preview shows the person on the background chosen and even supports Sandwich Overlays. The system can create multiple images on a single output or a simple single image output that can be printed, emailed or texted to your phone. Eaily setup an open photo booth at your kids next party. Make money at weddings and other events. No studio portrait photographer should be without Green Screen Wizard. Giving your clients a wide verity of background is just the start. The new image compare function will help your clients pick their favored shots. Once you pick the photo do want to keep the fine facial details but not show every skin flaw? Our skin smoothing software will let you dial in just the correct amount of digital makeup and skin smoothing. The Airbrush Editor can restore even the finest hair, remove any facial issue, whiten teeth and even apply makeup! The frame system can give soft edges to the background. Lighting effects can be used to make your portraits come alive. Elegant settings produce great bridal portraits regardless of venue. The Airbrush Editor can fine tune bridal veil transparency and restore the green parts of the bridal bouquets. Add diversity to a model's portfolio with beach or exotic location shots. Swimsuit models do not use makeup on their bodies but the Wizards skin smoothing software creates smooth skin on the entire skin surface. Using special effects can give a model images that she cannot get from other photographers. The "Woman on Fire" silhouette is a particularly popular. Models standing in the water with a reflection is also fun to do. Pet photography is a nightmare for green screen photographers. Dogs and Cats are nothing but difficult to restore hair from head to toe. With the Green Screen Field Processing to handle most cases and the Airbrush Editor to fine tune hair restoration Pet photography just got a lot easier. In the past Vintage photographers were restricted to a simple set that they created, usually a bar setting. Now with Green Screen photography they can offer vintage homes, bars, western towns and more. The Wizard has a built in effect to automatically change the color image to Black and White or Sepia tone. With the new effects system you can add texture, lighting effects, reflection and a wide variety of special effects. Green Screen Wizard offers a simple, intuitive user interface that makes it easy to learn, easy to use, and fun for all ages and skill levels. We feel that the most important thing in a green screen software package is the green screen removal engine. Our engine has evolved over 8 years of constant development to become what we feel is the best green screen engine in the world. Forget the marketing hype of our competitors and try our free demo to prove it to yourself. Most images have large variations in the color and intensity of the background green screen. In the past this led to gray areas on the final background where the green screen was darker. With Green Field Processing the background is sampled at many locations for color and intensity, giving a exceptionally accurate green screen replacement. Great transparency can really add to the illusion that the person is in the background. Accurately computing this is very difficult. The Wizard does it automatically and supplies you with intuitive controls to fine tune it. When shooting in front of a green screen, some of the green color will spill onto the subject. These areas are not removed, and are not transparent but they need to have the green tint removed. Notice how the image on the left has a green tint to the rug and the tint is removed but the rug is not transparent in the second photo. Often the edges of a subject have a black or unwanted thin color edge. With edge blending this can be removed with a simple click. The trick is to not remove thin hair or other details.Notice how the image on the left has a dark line around the edge. After edge blending is turned on it is removed in the second photo. Probably the hardest thing to do in green screen processing is to restore natural looking hair. Early attempts at doing this failed miserably which gave green screen processing a bad reputation amongst professional photographers . A combination of transparency and spill removal seamlessly integrated is required to perform this task to the satisfaction of clients and photographers. With Green Screen Wizard Brown, Red, Black and Blond hair are all restored with high fidelity. There are times when you do not wish to integrate the background but simply create a transparent png file to be used by another program. By clicking "Output a transparent background" on the home screen a checkerboard pattern will show where the green areas have been made transparent. While we recommend using a green screen as people tend to have blue eyes and wear blue jeans and other blue clothing, the wizard does support blue screens when you need it. This is often required when a team has a green jersey, a school has a green uniform, or a bride carries green flowers. ICC Color profiles assure the highest quality color reproduction. The stored ICC Color profile in the input images is used to render the image. When images are saved the ICC profile stored in Green Screen Wizard/ ICM folder is use to render the image.